Believe it or not, your outfit colors can set the tone of the entire day. As you select your wardrobe, consider your personal goals and what energy you want to project into the world. Karen Rauch Carter, author of MOVE YOUR STUFF, CHANGE YOUR LIFE, shares the meaning behind 9 colors of clothing and how you can use them to get what you want in life. Let’s get creative with clothes now. Each color possesses its own vibration. And with that vibration comes its power. Tap into that power by intentionally wearing specific colors in specific circumstances. Mix and match to get exactly what you want out of life. Black is mysterious. Black is deep. Black is alluring. Wear black when you are in a reflective mood or wish to focus on your life path. Got Prozac? This color can bring some people down, so do some mood monitoring before wearing black. Blue has the ability to calm people inside. This is necessary to find internal thoughts—thus the Skills and Knowledge color. Wear it when you meditate. Wear it if you need to have a clear communication with someone (like breaking up or asking for money). Avoid this color if you have the blues. Green is soothing, something that all families want to feel when together. This color of photosynthesis can bring renewed life to something that appears lifeless and dull. Wear green if you are into “growing” a family or just generally in a community frame of mind. This is also a great healing color. Purple is the color of nobility. Everyone could use a little purple power. If there are two more days to survive until payday, feel rich and royal anyway by wearing purple. Red is a very bold statement indeed. It is the color of blood—a strength sign. Wear red in a situation where you need extra power—like when negotiating a raise or buying a car. Pink reminds us of the blush of a cheek, a softness within the skin, which can bring us to new heights with relationships. Increase romance in your life—cover yourself in pink. Avoid this color in situations where you need power. White is the universal color because it is really all colors—therefore the color of infinity and endless thought, or creativity. I believe creation was born out of white—not black or darkness, as some wish to think. Wear white to bring order to your creative ideas or excel in higher thoughts. Gray is between white and black. It is what takes the process from thought to action—thus the color between Creativity and Career. It is the action of creativity. Wear gray if you are in the middle of a project and seek its completion. Yellow is the color that helps us to focus on the matter at hand—on earth, our temporary residence. Use yellow to get grounded, focus attention, or cheer up. Want more tips? 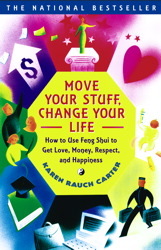 Pick up a copy of Move Your Stuff, Change Your Life by Karen Rauch Carter! Plus: Did you know that the way you arrange your work station can make a big impact in how you’re viewed by colleagues? Learn how to feng shui your office to gain respect at work. Excerpted from Move Your Stuff, Change Your Life by Karen Rauch Carter. Copyright © 2000 by Karen Rauch Carter. Used by permission of the publisher. All rights reserved. An essential and accessible guide to increasing happiness, improving your financial well-being, and bettering your health through the timeless Chinese art of feng shui. Promising health, wealth, and happiness, feng shui offers endless appeal—at least in concept. Unfortunately, feng shui’s seemingly complicated methods are often difficult to learn and apply in a meaningful way. Fortunately, Move Your Stuff, Change Your Life is written in plain and simple English for the modern Western reader. Karen Rauch Carter is a professional feng shui consultant and licensed landscape architect. She studied t'ai chi, yoga, alternative energy healing, and parapsychology prior to beginning her studies of Black Hat-style feng shui. She can be contacted at FengShuiPalace.com.